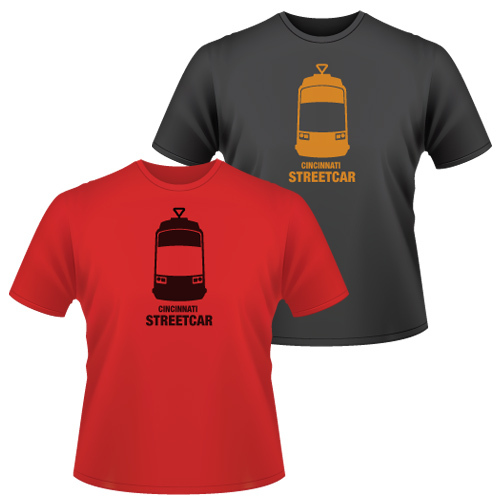 Following the initial success of the Cincinnati Streetcar T-shirts, a fourth run of the shirts has been produced. These shirts feature ‘gameday’ colors of either red with a black logo or black with an orange logo. “These shirts are the perfect way to show your support for the Cincinnati Streetcar and your favorite team” says Brad Thomas, founder of Cincystreetcar.com. The new shirts are available at Market Wines in historic Findlay Market located at 128 W. Elder Street open Tuesday through Sunday all year round. This entry was posted in Uncategorized and tagged Bearcats, Bengals, Business News, Cincinnati, Over-the-Rhine, Streetcar. Great idea to sell them at Market Wines. Will have to stop in to get a shirt and buy some wine from Michael! What’s up with the black and gold? Are those Steelers colors? Gasp! I assure you it is orange in person. I suppose I could be more practical and arrange to get one some other way too. It just wouldn’t be as fun. Either way, I send my love for the Streetcar from my new home in Boston.